Whilst examining the different stories told in ‘Portraits of Reconciliation’, published in the New York Times in April 2014, I decided to write about this image of Juvenal Nzabamwita and Cansilde Kampundu. 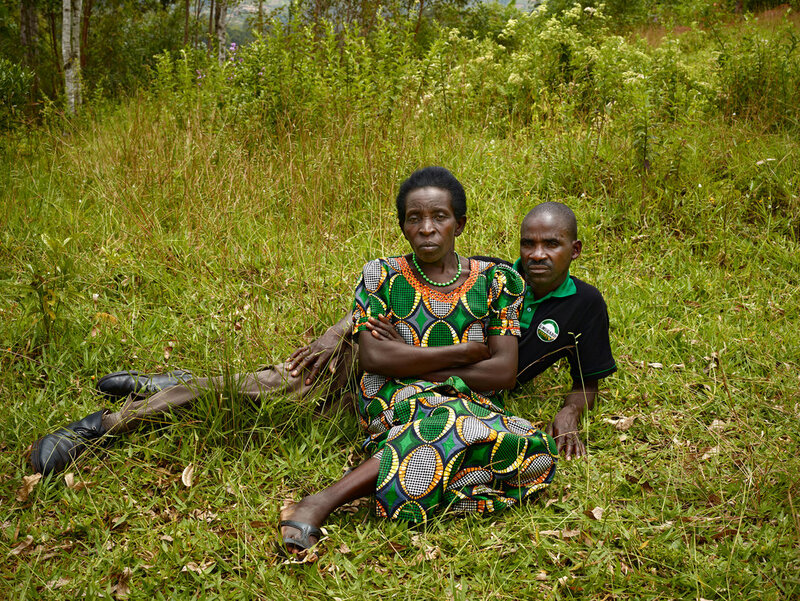 This is because I am intrigued by the body language the pair express in the image – for instance, Kampundu has her arms crossed, signifying that she is still reserved about the encounter, whereas Nzabamwita is stretched out on the ground, his body leaning into his arm carelessly. Although it was his father that killed her children, as he only looted her house, I think that a part of Cansilde will always resent the man and his family for destroying hers. Also, it looks as if Juvenal is posing for the photograph, connoting that he is enjoying the attention, but Cansilde is not. From the stories that they spoke about in the article, I think that the sole reason Kampundu accepted Nzabamwita’s forgiveness is down to her being scared that if she didn’t, there would be no one around to help or protect her during tough times. Based on the glimpse into Juvenal’s past, I think that he feels it is down to him to take care of Cansilde, as it is because of his relatives that her entire family were slaughtered in the Rwanda Genocide.